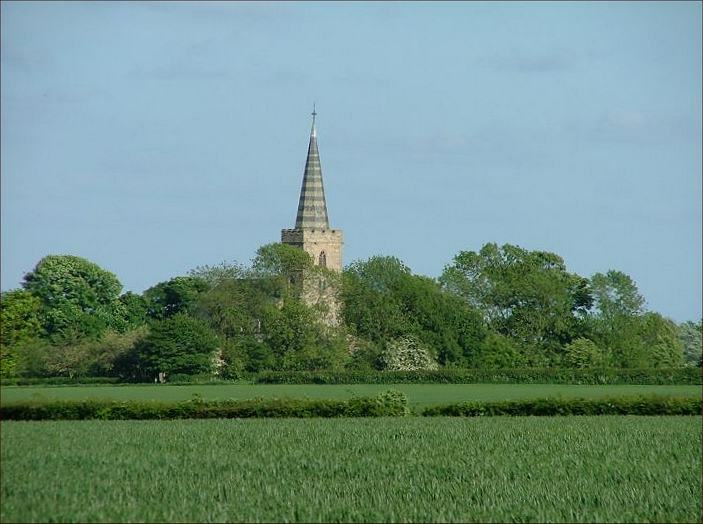 This is the story of an intensely rural Norfolk parish church, and the traumatic but ultimately triumphant journey that it made over the period of a decade in the early years of the 21st Century. 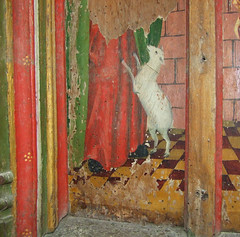 Ten years is not a long time in the life of a medieval church of course, which may well have stood there for almost a thousand years. 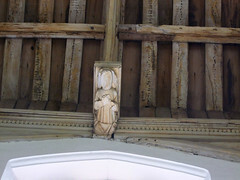 But they can make a huge difference, and St Mary is a good example of this. Over the course of a decade I made half a dozen visits to Beeston-next-Mileham, and it went from being a church which was nearly lost to us, to one made safe for future generations. 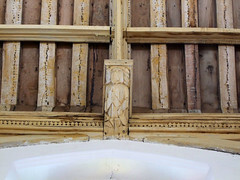 If you just want to see photographs of what Beeston-next-Mileham church looks like today, then skip to the bottom of the page. 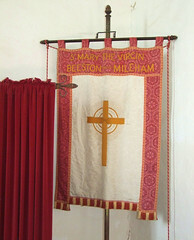 I first visited Beeston-next-Mileham in June 2003. 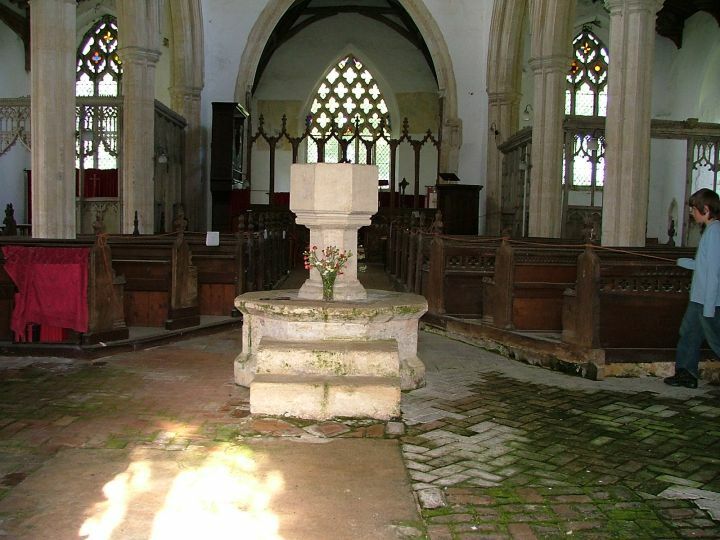 It was one of my first Norfolk churches, and that visit is still a burr in my memory. The early summer afternoon was wide and bright under the open Norfolk sky. All around, the countryside was burgeoning, shrugging off the last chills of the winter gone. A lark 'spiralled upwards in perfect pitch' as we snaked through the barley fields and copses on our narrow lanes, far from anywhere. A vale opened out to the north, and we skirted the top of it. Out there somewhere were the giant churches of north Norfolk, and beyond them somewhere the sea. Halfway along a lane that seemed to exist for no reason at all, like a beacon against the north, we came to the hulk of St Mary, Beeston-next-Mileham. The village, or what remains of it, is a couple of miles off, so all we could hear was birdsong and the occasional distant grumble of sheep. 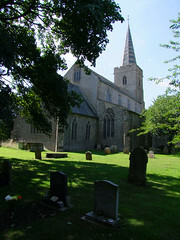 Such large churches are, of course, not unusual in Norfolk, but it is uncommon to find one so remote from civilisation. Even Salle, famously the cathedral of the Norfolk fields, has a cricket pitch and a village hall beside it. Here, there was nothing, except us, the sheep and the warm windless air. The banded brick spire is unusual both in design and in that it exists at all. 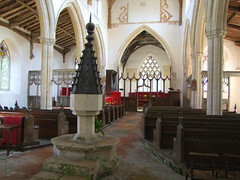 It dates from the 1870s, replacing a more familiarly East Anglian spire and cupola that were destroyed in a storm. There is a brooding Victorian sadness about it, perfectly in keeping with the setting and interior, as I was about to find out. 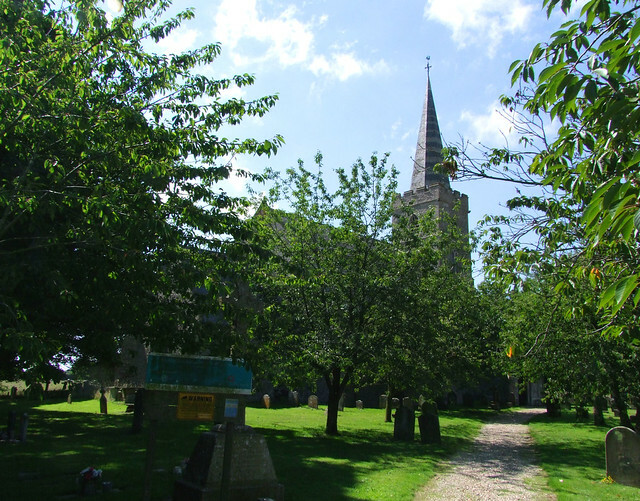 We opened the gate into the churchyard, which had been fenced into sectors for grazing sheep, so you needed to be quite athletic to do a circumnavigation of the church. It was clear, however, that there had been plenty of money here in the early 14th Century and again a hundred years later. Before the Black Death came along they had built the tower and the aisles, and perhaps a clerestory. 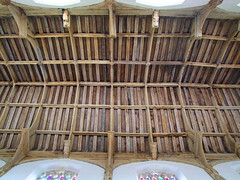 In the early 15th Century the roof and present clerestory were added, and the tower refashioned. The whole piece just sits there now, as if for hundreds of years it has been waiting for something to happen. 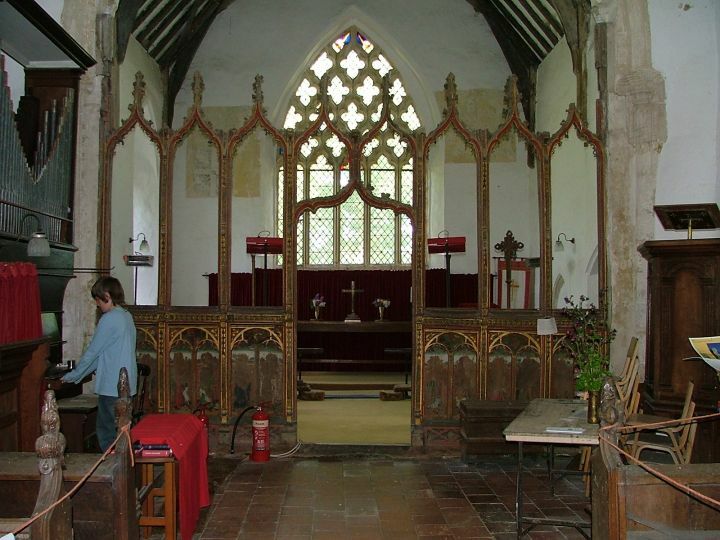 We stepped inside through the north porch, into an interior which was quite literally breath-taking - at the time I suffered with asthma, and I had not stepped into such a damp church before. My immediate impression was of a church that was slipping away from us. The brick floors at the west end of the nave were green, beautiful yet deadly. Even the font had begun to succumb. I had to concentrate on my breathing. And yet I would not have wanted you to think that this felt like a neglected church. Rather, it seemed as though it was organic, at one with the land around and beneath it. 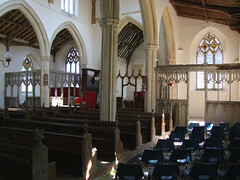 Above, the glorious 15th century hammer beam roof and the contemporary benches with their pierced tracery backs were silvery with age. At least one of our party found it a sad place, and I too felt infected with a brooding that often comes with grief at a loss. But it was, undoubtedly, beautiful. The top two rows of photographs below were taken on that first visit in 2003, the row at the bottom in 2005. Above the chancel arch, the window that back-lit the rood had been filled with garish purple glass, very curious and more than a bit unfortunate. There was a fashion for this kind of glass at a certain point in the late 19th century (at its worst, see Wiveton). 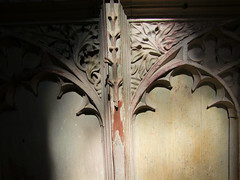 Below it, two parts of a scrollwork frame with a gap between was the setting for the royal arms, now preserved in the south aisle. 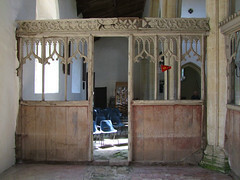 At the time a set of arms was first put in place here, a man called John Forbye donated a set of stalls. These have gone, but the Latin inscription remembering the event remains. The Victorians made do and mended here rather than indulging in a full-scale restoration. 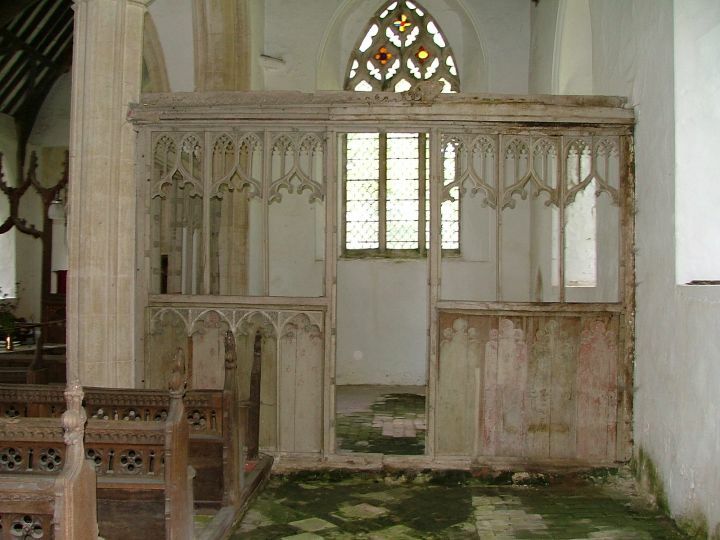 But in such a big church with such a sparse congregation, that would have been expensive, and so Beeston, like Blythburgh and Salthouse, benefited from the mercy of neglect. 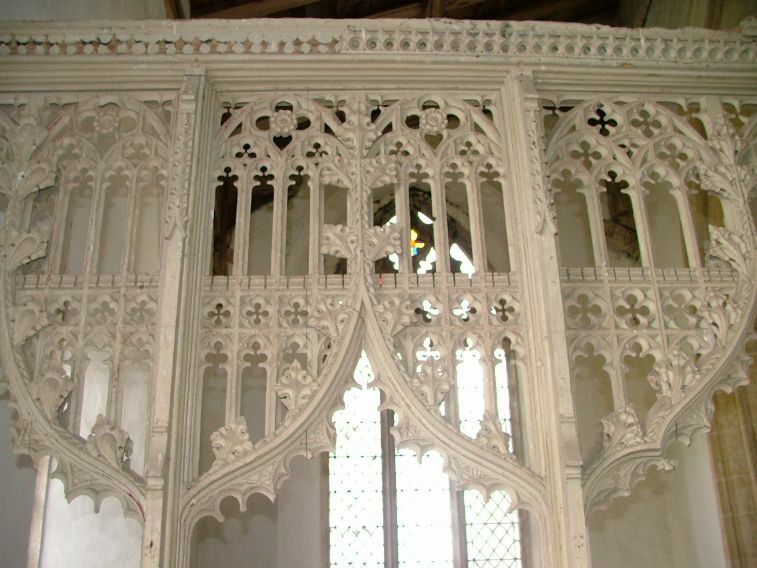 In a busier place, they would probably have repaired the rood screen, which looks very odd with the spikes of its coving sticking up into thin air. 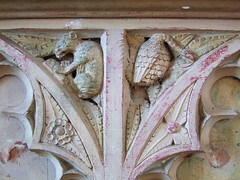 It is a strange delight, the carvings including mythical creatures and a mythical Saint, St George. 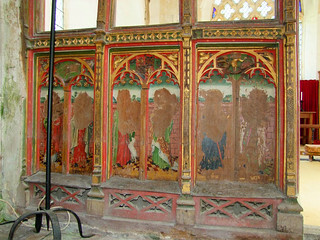 The panels, in which the figures are set curiously in a courtyard with a brick wall behind and gardens beyond, include a touching St Agnes with her lamb, and an anchor-carrying St Clement, and the parclose screens offset the whole of the east end in a charming way. The top row of photographs below were taken in 2005, the lower row in 2013. This church was not redundant of course, but it already felt like a Churches Conservation Trust church, as if this was the best way of maintaining buildings like this one. 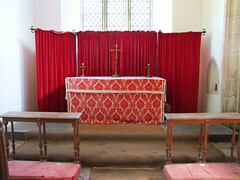 It was hard to imagine a service taking place here, but they still did, in the chancel apparently, several times a month. Done, we set off in the direction of the Dunhams, a gentle return to the 21st century from this place apart. And yet, this parish has touched the modern world at least once in a brash and unexpected way. 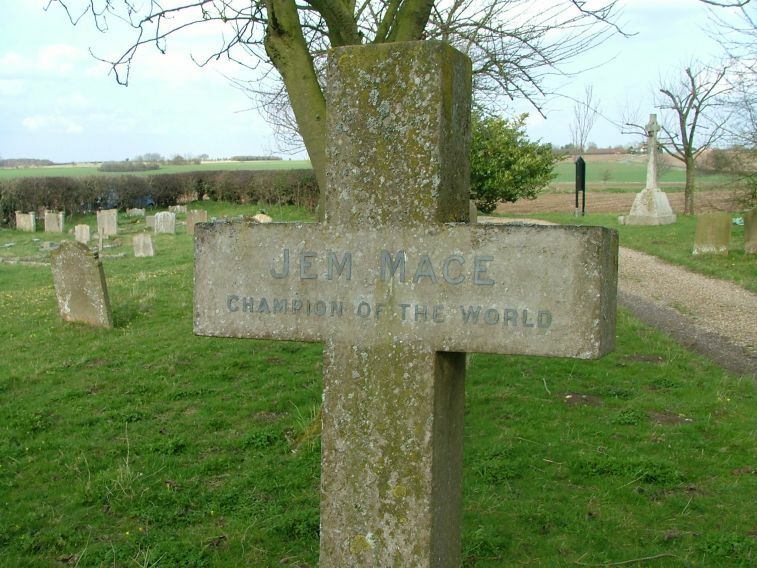 Beeston-next-Mileham was the birthplace of 'Gipsy' Jem Mace, heavyweight boxing champion of the world in the 1870s. He spent most of his life in America, and is buried in Liverpool, but a stone here remembers him, and Sam Mortlock was delighted to discover, across the path, another headstone to a certain 'Henry Cooper'. Serendipity. And all about, the silence continued. In late May 2005, I visited the church again. It was almost exactly two years later. A new sign on the gate told us that the church was no longer opened except when someone is in attendance. 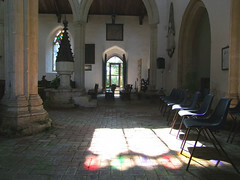 It suggested that visitors should come to a service if they wanted to see inside. The reason it gave was a series of thefts, but when we let ourselves in there appeared to be a more likely reason. It seemed to me that nothing had been done here at all since my last visit, except that the benches and parclose screens had been roped off as dangerous. 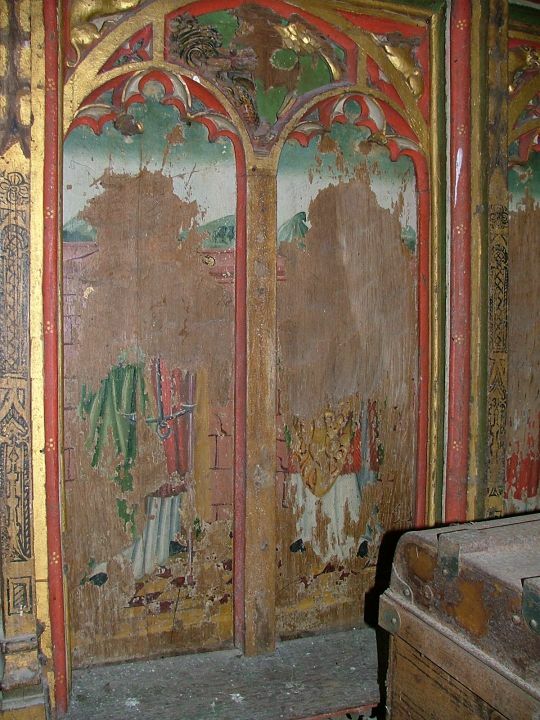 And indeed, the woodwork was in a terrible state. 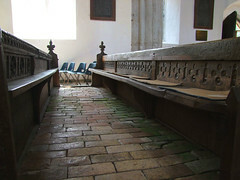 It seemed that nothing has been cleaned for several years, the benches were filthy, spattered with bird mess, and there was a wide raft of bat droppings across the floors, which were damper than two years previously. 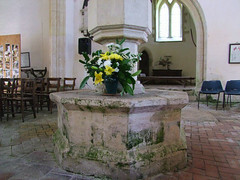 The 15th century crocketted font cover was still under the tower. 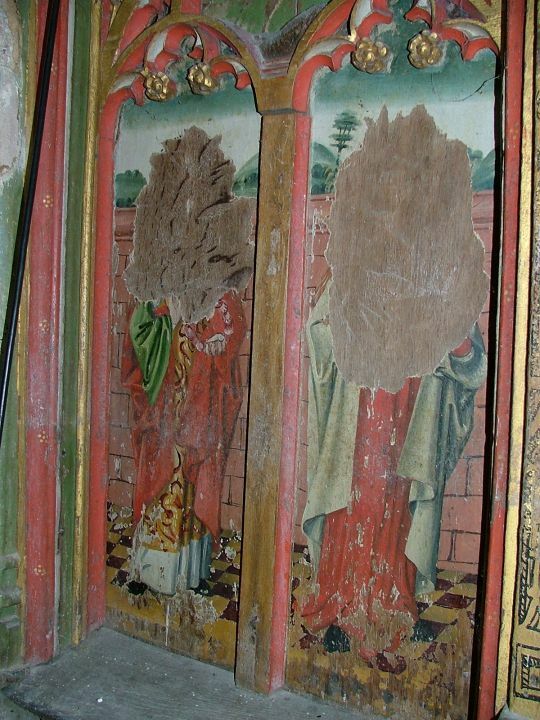 St Mary was suffering serious neglect, and I imagined that visitors were being kept out for their own safety, because it really was a health hazard now. As the Church of England undergoes a period of managed decline, it has generally been careful to safeguard the future of its less necessary buildings. It struck me immediately that this was not happening here. 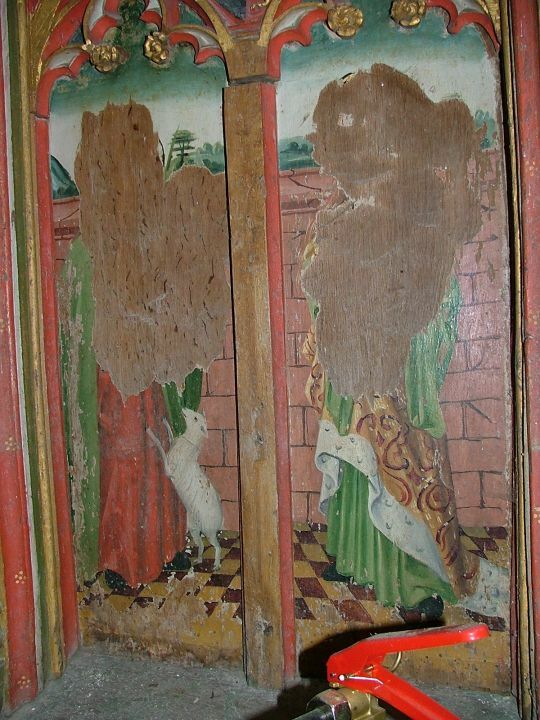 For whatever reason, what appeared to be a slow withdrawal from this church was making it increasingly vulnerable. Thanks to the ban on visitors, there were now few names in the visitors book compared with two years ago. 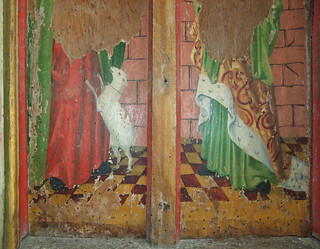 The visitors before us, some six weeks previously, wrote simply Please save this church! 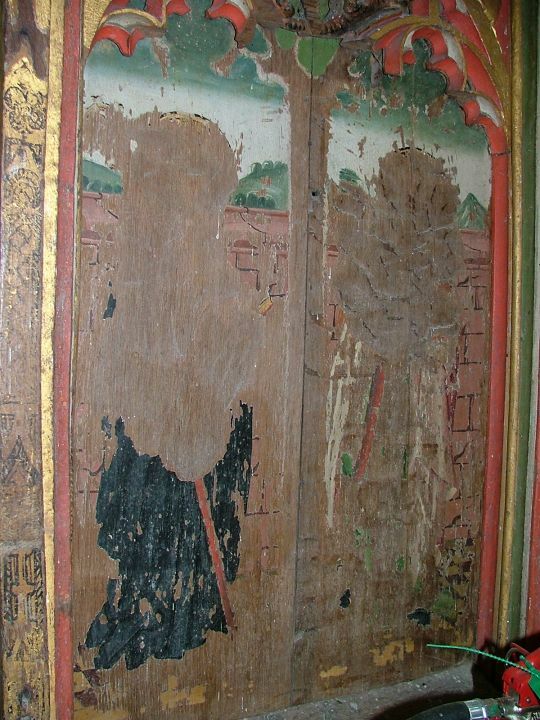 But a reminder of former glories could still be found in a frame on the north wall. Some ten years ago, this church was the venue for a concert given by Dame Kiri Te Kanawa in the presence of the Prince of Wales. Hard to imagine, now. We left sadly, locking the door behind us. In March 2006 I received a message from a correspondent of this website, who told me that I visited yesterday and allowed myself two hours to do everything I could to gain access ( am trying to visit all 1000 of Simon Jenkins amongst others) but had low expectations. 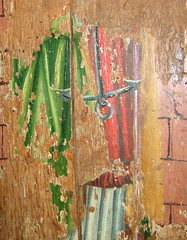 Anyway I found the church door unlocked and surveyors in attendance discussing the major renovations about to start.Whilst there is still no public access apart from services and little to see as everything apart from the chancel, where all services are held is sheeted, there is a plan and apparently a 2 year timescale for a major repair. In April 2006, Tom and I visited, and found work well underway. I took these photographs below, deciding to come back and check on progress later in the year. In the end, it was more than a year until I came back to Beeston-next-Mileham. In July 2007, one of the rare days of that month which was dry, and the sun shone, Peter and I took the lonely road from Great Dunham. In the distance, the treetops around ruined Kempstone boiled in the clean light, and a rooftop towards Mileham gleamed. We arrived at the church to find a heavy duty metal barrier across the graveyard entrance, and although this could be easily circumnavigated, a notice board just beyond it halted us. WARNING, it read. IMAGES AND/OR SOUND ARE BEING RECORDED FOR THE PURPOSE OF CRIME PREVENTION AND YOUR PERSONAL SAFETY. Above, another sign reminded us that a repair grant from the Heritage Lottery Fund was helping pay for repairs, but there was no actual reminder to keep out, so we stepped through into the graveyard, which was beginning to show the signs of several years of neglect, as you may imagine. Building work was even more entrenched. 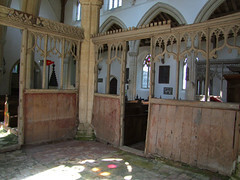 Within the south porch, the floor had been removed and was covered with what looked like rather precarious boarding. There were channels being dug outside the church, presumably for drainage. 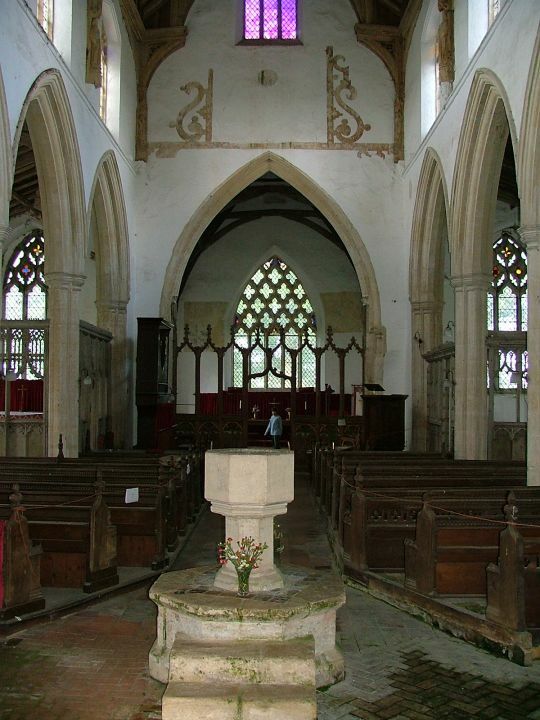 We let ourselves into the church, into that familiar Beeston-next-Mileham smell of warm earth and damp. 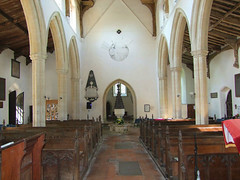 The nave was as full of scaffolding as it had been more than a year previously, although now all the plastic protective wrapping on the woodwork and font had been removed, and was draped on the scaffolding above. Much work seemed to be still afoot, and looking up the ceiling was completely obscured by boarding. 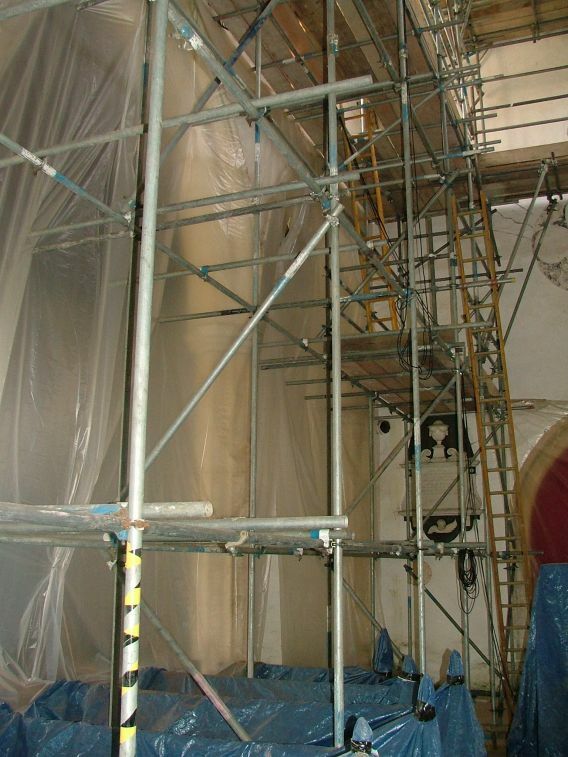 I looked up into the cathedral of scaffolding and plastic sheeting. St Mary had always felt sad to me, and now, after several years of firstly neglect, and then traumatic repair, it seemed sadder than ever. I might even have wished it back to when I first saw it in 2003, obviously unloved, but still so beautiful. It was hard to imagine how it might emerge from this chrysalis-like state. Outside, I gazed from the lonely road northwards, watching the Breckland become High Norfolk, realising that it had become one of my favourite places in England. I came back to Beeston-next-Mileham in 2013, ten years after my first visit. I wasn't expecting any great surprises, because other visitors had kept me up to date with developments, and I knew the work had been completed and that St Mary was open for business again. It was a beautiful August day, the temperature in the high eighties but with that bustle of a breeze that always seems to be present out here on the ridge. We came from Mileham, the spire a beacon along the long winding road. The churchyard was idyllic, the depredations of the builders' lorries and skips long since forgotten and forgiven by the the lush healing green of the grass and trees. Stepping inside instantly recalled that first visit ten years previously, but the healing had happened inside too, for the stench of damp and air of decay was dispersed, as if they had never been. Everything is restored, on a grand scale in the architecture but in the little details too, and at last for me the veil of sadness was lifted. 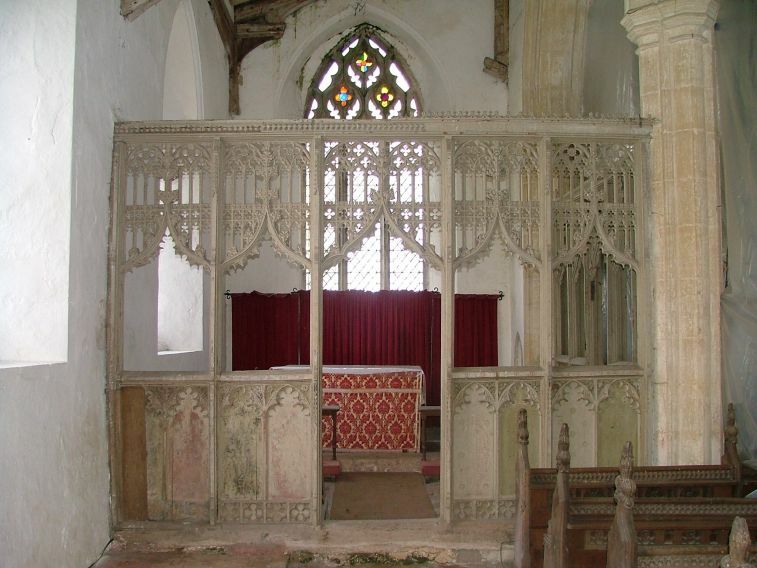 It struck me then that there must have been many occasions over the centuries on which the medieval churches of England had been brought back from the brink like this, and many when they hadn't and had been lost to us. I was glad I'd seen it happening here.